In her debut YA science fiction novel, Janci Patterson presents a thriller that #1 NYT bestseller James Dashner calls "a fantastic book" and #1 NYT bestseller Brandon Sanderson calls "hands down one of my favorite novels of the year." In the world of high-stakes espionage, it pays to be able to change your face. And that’s just what sixteen-year-old Jory and her family of shape-shifting spies can do—alter their faces and bodies to look like anyone. Jory is in training to be a full member of the family business—when she can convince her parents to let her help with their elaborate cons. But saving her family may be the most difficult job of all. "A Thousand Faces is a well-plotted race of a story with fantastic world building. A paranormal Mission Impossible for teens, Jory's world and story are so meticulously parsed together they make you want to look twice at every face you see on the street." "A Thousand Faces is one of those rare books that can include heartbreaking and swoon-worthy romance and equally skillful action and suspense. It's a terrific novel." 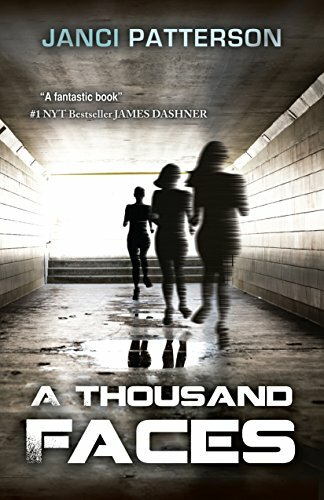 "A THOUSAND FACES is the YA thriller I've been waiting for: a fantastic, troubled heroine, struggling with an incredible power she only barely controls, trapped in a web of supernatural espionage where she can't trust anyone. The pace is quick, the intrigue is devious, and the magic is absolutely fascinating. A brilliant combination of romance, science fiction, and the supernatural."